Albert Einstein once said, "You cannot solve a problem with the same consciousness that created it. You must stand on a higher ground.” The Sun poem speaks to our consciousness. In 1985 it was promoted in a citywide multimedia public service campaign throughout Boston. It was posted on billboards, in the mass transit and aired on WBZ, WHDH and WCVB TV as a public service announcement. The campaign was so successful it was implemented in New York City and CBS and NBC network TV aired the public service announcement across the country. This timeless, transformative poem has been a source of inspiration. 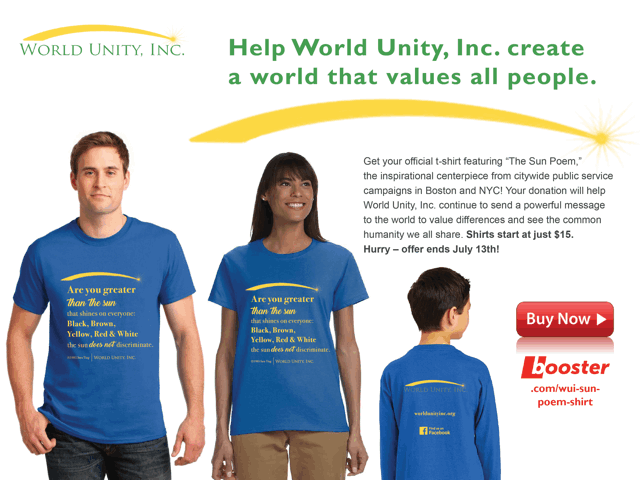 It inspired the creation of World Unity Inc., with a vision to build the World Unity Landmark showcasing the Sun poem, a song and a campaign, “Singing Equality across America.” We now have the poem on a T-Shirt! We hope you’ll purchase one or two. Wear the Sun poem and make an impact where ever you go. Help us transform minds and hearts to value all people. All proceeds go to World Unity Inc.